Is It Okay to Like Recovery of an MMO Junkie? After watching several battle shōnen anime all in a row, I was starting to get tired of the genre and wanted to watch something completely different. When a friend found out I needed a change of pace, he recommended Recovery of an MMO Junkie. A slice-of-life anime about a woman my age? Perfect. Slice-of-life anime are usually low-stakes shows about the everyday life of normal people. While shows in this genre can dabble in the fantastical (see Miss Kobayashi’s Dragon Maid), they don’t have nail-biting tension. I love this genre of Japanese anime because its equivalent can’t be found in Western media. We have our sitcoms, but slice-of-life anime don’t have to be comedic in nature. 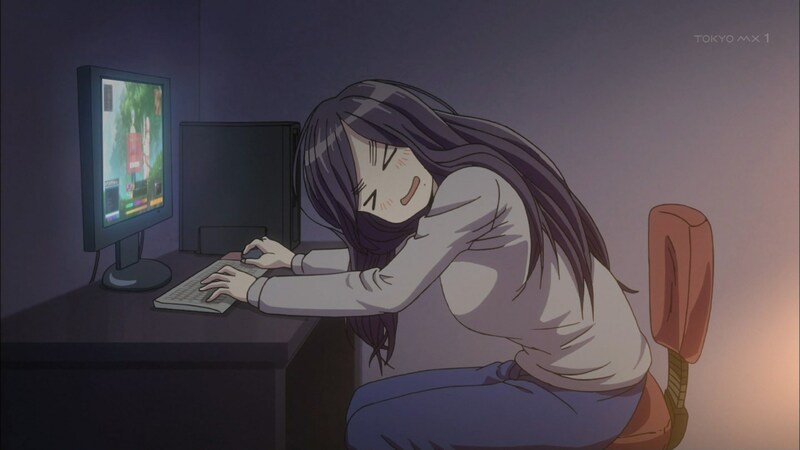 Recovery of an MMO Junkie follows the life of a 30-year-old woman named Moriko Morioka who quits her stressful job to become a NEET, which stands for “Not in Education, Employment, or Training.” The morning after Morioka quits her job, she hops online to find a new MMO to play and lands on a cute one entitled Fruits de Mer (a fun tribute to RuneScape). After creating her character and naming him Hayashi, Morioka meets someone named Lily, and through Lily, joins a guild and makes a host of new friends. The anime does a great job of seamlessly switching between fully animating the MMO world Hayashi lives in and Morioka’s freak-out sessions at her keyboard, which you can see below. The contrast is hilarious, and if you’ve ever played an online game, what Morioka goes through is completely relatable. Oh no! This person opened a chat with me! What do I say?! There’s also tons of fun callbacks to other MMOs that every gamer will appreciate. What I love especially about Recovery of an MMO Junkie is the main theme. At first glance, you might imagine the anime is about someone addicted to online games and quits so they can return to normal life. In actuality, Morioka quits her life. It’s through her online friends she finds the courage to be present in the real world. Recovery of an MMO Junkie celebrates the idea of meeting people you care about online and adds some wonderful twists of fate into the mix. When Morioka meets some of her online companions in real life, they immediately accept who she is despite her awkward social skills. Even in the anime’s short 10-episodes run, there’s a real sense of character progression. As Morioka levels up her character and meets new people online, her normal life gets better as well. The anime cleverly conveys this by beginning to use the game’s soundtrack for Morioka’s real life when events begin to look up for her. The story ends with a sense of a chapter being closed and good potential for a second season. So, if this show seems so wonderful, why is there any doubt as to whether someone should like it? Unfortunately, Recovery of an MMO Junkie is plagued with controversy, and it isn’t the kind that’s normally associated with anime. A month or so after the anime finished its seasonal run, tweets posted by the series director, Kazuyoshi Yaginuma, began coming to light. His tweets were anti-Semitic and conspiratorial in nature and posted in both Japanese and English. “Have you looked into whether Anne Frank’s diary is real?” Yaginuma asked in a tweet. The controversy lit up the anime community with fans honestly asking themselves, “Is it okay to like this show?” For some, the answer is yes. Even though the beliefs Yaginuma spews are conspiracy theories and anti-Semaitic, the original source material is a web comic written by Rin Kokuyo. And while a series director is responsible for the overall tone of a show and its art direction, series directors aren’t usually involved with the writing. Thus, Recovery of an MMO Junkie has no hints of anti-Semitism. Some fans argue an anime takes a lot of talent to produce and shouldn’t be judged because of a singular person working on it. For other fans, the answer is no. Despite Recovery of an MMO Junkie being a collaborative effort with separate source material, watching and buying the anime still supports the series director. Even if there are no anti-Semitic views in MMO Junkie, the anime’s success increases the director’s likelihood to be hired again, where his views may get an opportunity to seep into whatever he’s working on. For some fans, a director having those viewpoints is deeply personal, and it would be wrong to support those views in any way, shape, or form. The controversy surrounding MMO Junkie brings up a longtime discussion surrounding art: where do you draw the line on media that’s been tainted? Is there a clearly defined answer to this question, or is the sharp black and white a murky gray? Is it okay to decide on a case-by-case basis, or is it set in stone? Depending on who you are, your answer might lead you to give MMO Junkie a try or cause you to skip it entirely. If you’re like me and saw the anime before you knew of the director’s hateful views, you must answer a different question: Is it okay to like Recovery of an MMO Junkie? The answer to that question depends entirely on you. But whatever conclusion you come to, it’s worth the time spent thinking critically on this issue. The answer is yes, btw. It’s perfectly okay to like this show. To not like the show is to deny credit to the rest of the talented individuals who made it a reality. A director’s creative freedom is generally directly related to how much their name is a draw to fans. His exposure as a director is minimal, and the producer had most of the control. Or think of it this way, should you dislike Pokemon Generations because he directed 3 of the episodes? No, that’s ridiculous. To do so would be akin to revoking all the Academy awards for Tess because Roman Polanski directed it. The true casualty of this situation is the potential for a season 2, that will never happen now. The real victims are the manga artist, animators, cast and crew.